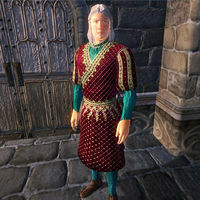 Fafnir is a Nord assassin and member of the Dark Brotherhood who is currently playing the role of doorman and keymaster for Summitmist Manor in Skingrad. He only appears at the start of the quest Whodunit?, and disappears as soon as you enter Summitmist Manor. He will be standing right next to the entrance, never even eating or sleeping, waiting for you to make your appearance. Fafnir wears upper-class garb consisting of a red velvet outfit and green velvet shoes. He also carries a few gold coins and a steel dagger. As soon as you approach the manor Fafnir will approach and greet you with "So, the last guest finally arrives. I'll tell you what I told all the others. You go in, I lock the door. You don't come out 'til it's over. Now I'll tell you what I didn't tell everyone else. We have the same Mother, you and I. And she wants you to have this. It's the key to the house.I guess someone else has already told you the other details. Kill all the guests then leave, right? Well, you'd better get in there. Time to mingle." Talking to him again will elicit the response "Well, what are you waiting for. There's a party, and you're the guest of honor. All I get to do is lock the damn door. You get to have all the fun." In either case, leaving conversation with him will cause him to gloat "Go, go! Socialize! Talk to those fine people, and then plunge your knife into their throats when they ain't lookin'! Ha ha ha ha ha ha ha!" Whenever you get close to him, the weather will turn stormy. Esta página foi modificada pela última vez à(s) 23h49min de 9 de fevereiro de 2015.